I need to replicate how other email programs deal with attachments and get the attachment displayed at the top. 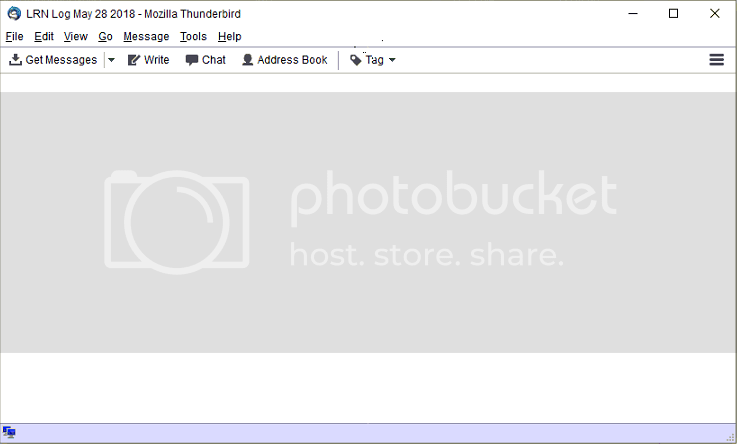 Been through this forums several ways from Sunday and all the suggested solutions are to use userChrome but they are for older versions of TBird, I got version 52. Have you tried the userChrome solution in your current version? There's no way to know whether or not it will work without trying? The download pane is expanded by that factor. It's ALWAYS shown with the above! Where did you find the userChrome.css to do this, and are you trying to add the attachment bar to the top of received messages? I see nothing attachment related in your screenshot. All it did for me was make the Attachment Pane larger at the bottom of the message. Yes, I want to add the attachment bar to the top of the received message. Found the userChrome somewhere in this forum, there was two variants. It was to move the attachment bar to the top of the message, that is what I end up with in the screenshot, an empty window. "No chrome package registered for chrome://userchrome/content/userchrome.xml"
I tried the following code in the error console. It still works. It should not be this hard to implement, I'm getting nothing. I just tried it. I got the attachment bar above the message body.